Weather changes, typhoon season, and busy festivals should all be taken into account while deciding when to go to Japan. The best time to visit Japan is during early spring when the short-lived cherry blossoms are blooming but before or after the busy stretch of Golden Week holidays. Although avoiding lousy weather is usually the goal of vacations, consecutive sunny days draw bigger crowds to East Asia. You'll have to share transportation and attractions during high season. Hotels are already a bit pricey in Tokyo, but they skyrocket during some of Japan's busiest festivals. With an archipelago of close to 7,000 islands spread north to south in the Pacific, the weather in Japan can differ significantly between regions. Tokyo can be near freezing while people enjoy T-shirt weather just a little south. Most of Japan enjoys four distinct seasons, with snow in the winter. However, Okinawa and the islands in the south stay warm throughout the year. Northern Japan often receives heavy snowfall that melts quickly in spring. Tokyo itself doesn't ordinarily receive much snow. The megalopolis got a dusting in 1962, and then snow made headlines again in 2014 and 2016. In January 2018, a massive snowstorm caused disruptions in Tokyo. Even when no typhoons are spinning nearby to mix things up, Japan is a relatively wet country with ample rainfall and high humidity. The rainy season in Japan typically hits in the summer months, around the middle of June to the middle of July. In Tokyo, June is a stormy month. Historically, showers slack off just a bit in late July and August then return with force again in September. Adding to the meteorological madness is the threat of typhoons. Typically, most typhoons cause trouble for Japan between May and October. As you can imagine, a typhoon in the area completely changes everything weather-related—and not usually for the better. A better way to call the time of year most travelers visit Japan would be the "drier" or "less rainy" season. Rainy days are a thing throughout the year, so building too tight of a sunshine-based itinerary could lead to disappointment. Fortunately, Japan has some exciting ways to spend time indoors during rainy afternoons. The driest months in Japan are typically December, January, and February. November and March are "shoulder" months between the seasons—often an ideal time to visit any country to avoid peak-season prices and groups. Typhoon season for the Pacific Ocean runs between May and October, although Mother Nature doesn't always go by the Gregorian calendar. Storms can arrive early or drag on later. August and September are usually the peak of typhoons in Japan. Even if they don't threaten Japan, big typhoons in the area can cause severe delays and congestion for air traffic. Check the Japan Meteorological Agency website for current warnings before you plan to travel. Your ticket may be refundable if your travel insurance covers trip cancellation due to acts of nature. Visiting Japan when big festivals are in progress is a great way to get in on the fun and see locals enjoying themselves. But on the other hand, you'll have to compete with crowds at popular sites and pay higher prices for accommodation. Either make a point to arrive early and enjoy the festival or avoid the area altogether until regular daily life resumes. Christmas and New Year: Celebrations for Shogatsu (Japanese New Year) can get busy. From the week before Christmas until a few days into January, malls and public transportation are even more crowded. During the holiday season, the Japanese public gets a rare chance to see the inner grounds of the Imperial Palace. This happens on only two days a year: the Emperor's Birthday (December 23) and on January 2. Obon: Temples and shrines get busy in the summer during the three-day Obon festival. Dates for Obon vary, depending upon the place in Japan. Obon in Tokyo and eastern parts of Japan is usually observed around July 15. Hachigatsu Bon, an even busier time, is celebrated around August 15. Although Obon, commonly just called Bon, is not an official holiday, many Japanese families take leave to pay homage to ancestors around that time of year. Kyoto is a favorite cultural destination for tourists in Japan. The busy season months here can become very crowded. Spring and fall are the busiest times in Kyoto; October and November are the peak months for tourism. Consider booking your trip to Kyoto in August when rain slacks off a little but crowds haven't surged yet. If cold weather doesn't scare you, January and February are good months to visit Kyoto. You'll certainly want to book accommodation in advance if visiting Kyoto in November. January is winter across much of the country, although some areas like Okinawa remain semi-tropical year-round. This can be a much quieter time to visit, especially after the rush of the New Years holiday. Seijin-no-hi (Coming-of-Age Day) is celebrated on the second Monday of January. This date is considered the collective birthday for all who have turned 20, the country's age of majority, in the past year. Shōgatsu is celebrated from January 1 through 3 each year. Many families gather together for meals and other celebrations. February is generally Japan's coldest month, but if you like to ski, it's among the best times of year to visit. Many times, plum (ume) blossoms begin blooming toward the end of the month, signaling that spring is on its way. Temperatures in Tokyo typically average around 45 degrees Fahrenheit, while it can be as cold as 20 degrees up north in Sapporo. More than 2 million visitors head to Yuki Matsuri in Sapporo. This annual snow festival includes an international snow sculpture contest, ice slides, and more. February 3 marks the first day of spring on the traditional lunar calendar, and it's also celebrated in Japan as a day in which one must ward off evil. People often visit Buddhist temples and ward off the devil, while welcoming fortunes in. Japan is extremely enjoyable to visit during the spring. Large crowds of people flock to local parks for picnics, parties, and to enjoy hanami —the deliberate viewing of cherry blossom and plum blossom flowers. Families, couples, and even entire offices get in on the fun. The timing of the blooms depends entirely upon the warming weather. The flowers begin in Okinawa and warmer parts of Japan around mid-March, then move north as the weather gets warmer until early May. Forecasters predict the timing as blooms appear from south to north. Tokyo's international anime fair, AnimeJapan, is the world's largest anime festival, held each March. By late March, Japan is in a full-blown cherry blossom craze. While it's hard to predict when exactly the season will fall, the last two weeks of March are typically a safe bet. A tradition all over Japan, Hanami literally means viewing flowers. Picnic under the beautiful flowing trees in any public park during this special season. Usually lasting for only two weeks in March, the sakura (cherry blossom) schedule changes a bit every year, so it’s hard to nail down exactly when to come. April gets extremely busy in Japan, as cherry blossoms are usually peaking. But why not join in on the fun? The weather is sunny, crisp, and clear. Beware, though: School holidays and Golden Week, at the end of the month, can cause crowds to swell. Takayama hosts a famous spring festival each year in mid-April. It includes floats lit with lanterns and a festive lion dance. Miyako Odori runs throughout April in Kyoto. This festival showcases geiko dances and music. Buy tickets in advance! Golden week is the most significant, busiest holiday period of them all in Japan. 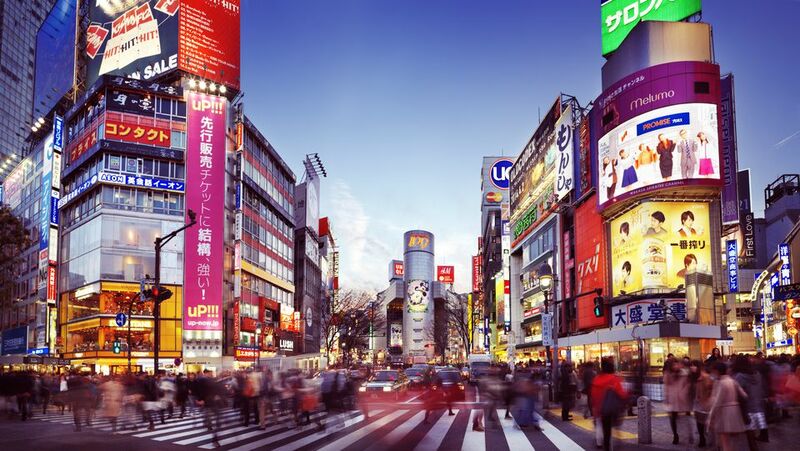 It's the busiest time to travel in Japan; you'll have fun, but watch out! Golden Week starts up around the end of April and runs into the first week of May. Several consecutive national holidays fall within a seven-day stretch. Many Japanese families tack on a valuable week of vacation away from work, so transportation and accommodation fill up quickly on both ends of the holiday. Public parks will be busy. Golden Week officially begins with Showa Day on April 29 and concludes with Children's Day on May 5. However, many families take additional vacation days before and after. The impact of Golden Week stretches to around 10 to 14 days. Sanja Matsuri is Tokyo's largest festival, bringing more than 1 million visitors to Asakusa. The highlight is an exciting parade of men and women in traditional dress. Early June in Japan is quite nice, but tsuyu (rainy season) sets in later in the month. While it doesn't rain all day, the gloomy and wet weather is the norm. Despite this, there are still plenty of things to do in the rain: Hot springs and wooded mountain temples are still quite serene, rain or shine. Additionally, hiking season kicks off as the snow melts in the Alps. In June, Osaka is home to a major rice-planting festival that dates back more than 1,700 years. During this celebration, 12 women plant rice seedlings in the paddy at Osaka's Sumiyoshi Shrine. Yosakoi Soran Matsuri is an annual folk dance festival held in Sapporo. The event attracts almost 40,000 dancers from all over the country and even more visitors. Dancers perform all over the streets and throughout city parks. Luckily, the rainy season in Japan is short-lived, and it's typically over by the end of July. The country is hot and humid this month, but abuzz with events and activities. This is a great time for a beach visit to Okinawa. Mt. Fuji officially opens to climbers on July 1. Gion Matsuri, one of Japan's most popular festivals, is held from July 17 to 24 in Kyoto. Intricate floats are pulled through the streets. This is a busy time to visit, so book well in advance. August is also hot and humid and can be crowded as many school children, and their families take holidays within the country. Hokkaido is a popular destination in August since the weather is prime for outdoor activities. O-Bon, in mid-August, spans three days of honoring the dead, whose spirits are said to return to the earth during this time. Graves are swept and presented with offerings, while lanterns are floated down the country's rivers. Many Japanese cities host dramatic displays of fireworks in August. One of the best shows is the Lake Biwa Fireworks festival, held near Kyoto in early August. September is still warm, but humidity begins to die down. This is the peak of typhoon season though, so Okinawa, Kyushu, and Shikoku are at risks of periods of extremely hard rain and high winds. Kishiwada Danjiri Matsuri is an interesting festival held in Osaka each year. Danjiri (festival floats) are released in the streets. Seto is famous for its ceramics and commemorates the craft each year during the second week of September. The eponymous festival features pop-up stalls selling affordable pottery and other handicrafts. Around 500,000 people attend each year. October is a fantastic month to visit, marked by bright, warm days, with little humidity. Fall foliage peaks in the Japanese Alps during this month. Roppongi Art Night is held each year in mid- to late October. Arts venues stay open all night and host large-scale installations and performances throughout this exciting weekend. Japan loves celebrating Halloween, and it's worth a visit to Tokyo's Shibuya district on October 31, if you want to see thousands of costumed revelers. November has beautiful weather, with temperatures beginning to fall at higher elevations and further north in the country. Temperatures in Tokyo range from 65 degrees Fahrenheit to 45 degrees, while Sapporo is as cool as 35 degrees at night. The Ohara Festival, held in the southern prefecture of Kagoshima, features a street parade of more than 20,000 dancers. Expect crowds of more than 500,00 people. If you are planning to visit Japan in December, avoid visiting during the last week of the month and the first week of January. While Christmas is not a celebrated national holiday, many people still take time off working during this period, which books up hotels and makes transportation more difficult. Many businesses close over the period leading up to New Years Day. On December 31, temple bells ring 108 times at midnight as part of Joya-no-kane, an annual purifying ritual. Kyoto celebrates the unique Daikon radish during the Sanpoji Daikon Festival. The vegetable becomes available in late Autumn, but the festival takes place in mid-December. More than 10,000 people eat the hot radish, which is believed to have health benefits.